Hooray!! 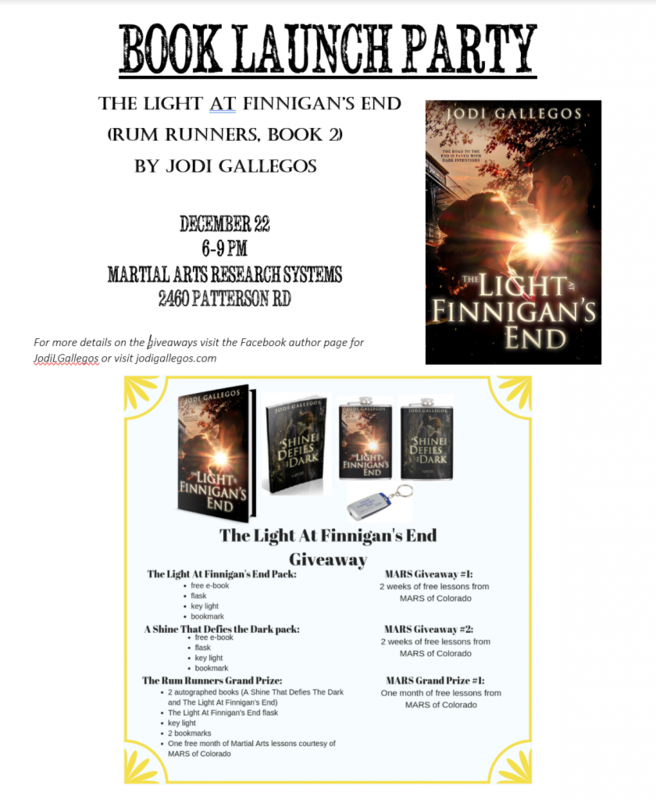 I have print books in hand and can finally announce the details of the local launch party for The Light At Finnigan’s End. My martial arts school has kindly offered to host my launch party (and has offered some giveaway goodies as well!). Each week leading up to the launch party I’ll be giving away free bookmarks, key lights, and e-books (US only). Winners of the Martial Arts Research Systems giveaways and Rum Runners Grand Prize will be announced at the launch party on Dec 22, and MUST be in the Grand Junction area. The stand-alone historical romance that stole America’s hearts has a sequel coming out TODAY! 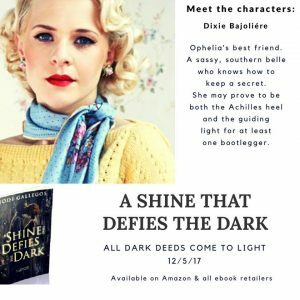 A Shine that Defies the Dark by Jodi Gallegos released in December 2017 and has received amazing reviews and shout outs from the public. So much so that the author decided to expand the world of the novel and create another sequel or world novel that can be read as part of the series or as another stand-alone Historical Romance. 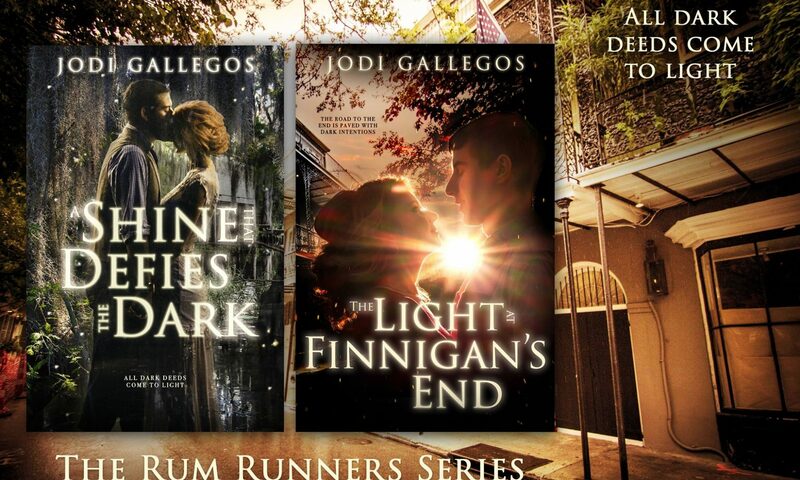 The Light at Finnigan’s End is now available for purchase! Grab your copy of book two in The Rum Runners Series today. Also, to celebrate, readers can check out the first novel for free on any online retailer this week only! Cleric’s Cove is home to the most brutal gang of bootleggers in Southern Louisiana, the Moret family. Desperate to find out what happened to her brother Finn, Deirdre Cassidy is determined to use her skills as a healer, as well as her feminine charms, to infiltrate the Moret crime family. Once she’s ensconced in the Moret hideout, she hopes to gather information that will lead her to Finn—or help her destroy the family that caused his disappearance. But the one thing Deirdre never counted on is Mo Moret. The eldest son and head of the Moret gang, Mo is incredibly dangerous, yet magnetic—the attraction between them palpable. Still, Deirdre doesn’t believe he’ll ever set aside family loyalty for love. And even if he did, Deirdre has vowed to see the end of the Morets—whatever the cost. 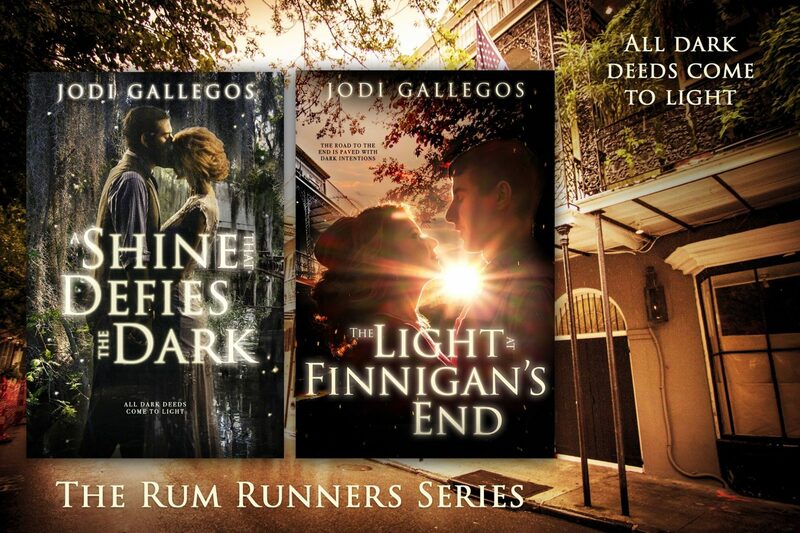 The second installment in the popular Rum Runners series by Jodi Gallegos, The Light at Finnigan’s End is a fast-paced romance with elements of historical fiction, set against the gritty backdrop of depression-era southern Louisiana. READ BOOK ONE TODAY FOR FREE! 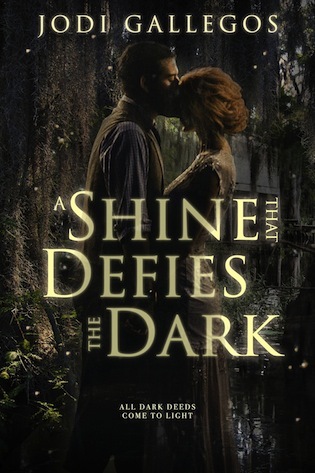 Gripping, romantic, and evocative of its time— A Shine that Defies the Dark is a spellbinding story of one woman who will stop at nothing to survive during a tumultuous time in American history. 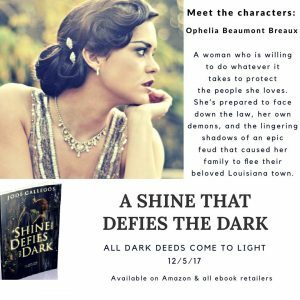 After a six-year exile, Ophelia Breaux and her mother are overjoyed to return to the Louisiana bayou. But it seems the ghosts of the epic feud that drove them away still haunt Plaquemines Parish, and with the Great Depression sweeping the nation, the two soon find they can’t make ends meet. Seeing no other option, Ophelia’s mother takes the drastic step of sharing her bed with the town judge in exchange for a reduced rent. The judge has had a life-long obsession with Momma, and Ophelia is desperate to end this arrangement and get her away from him. When Remy Granger shows up, Ophelia knows it could mean more trouble—and that’s the last thing they need. Handsome and dangerous, he’s the first boy she ever kissed, and a member of the most notorious family in southern Louisiana—but he’s also got an opportunity for fast money in rumrunning. Ophelia goes all in, and it turns out she may have a knack for the business. But she’s going to have to run even faster if she wants to save Momma… dodging the cops, rival gangs, and her traitorous heart at every turn. 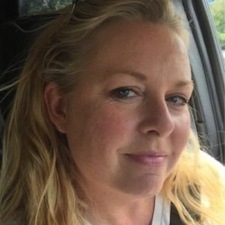 Jodi is a YA & NA writer, black belt, and registered nurse. She lives with her husband, three sons and an evolving herd of undisciplined animals in Colorado. She has a well-earned fear of bears, but tolerates the Teddy and Gummy variety. She has been obsessed with books, both reading and writing them, for most of her life and prefers the written word to having actual conversations. The most current projected completion date of her To Be Read book collection is May 17, 2176. 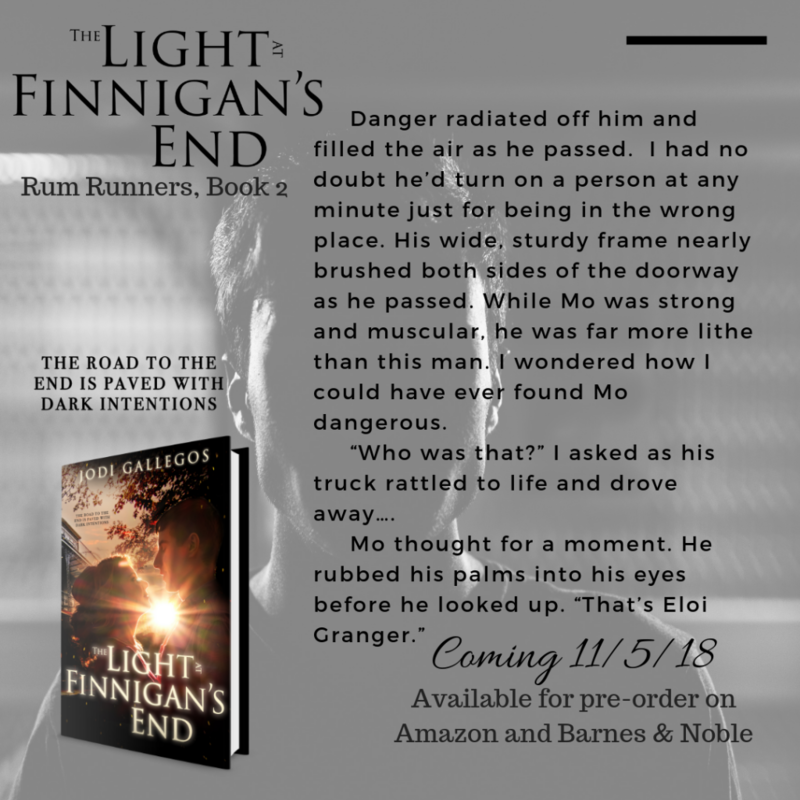 The Light at Finnigan’s End (Rum Runners, Book 2) comes out November 11, 2018 and what better way to celebrate than with a giveaway? 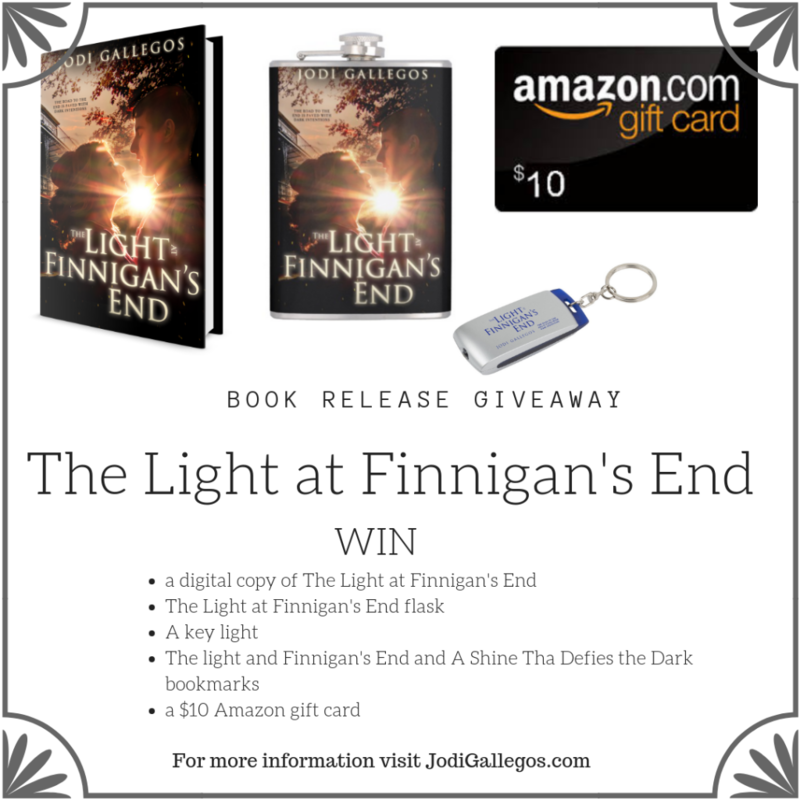 Follow the Rafflecopter link for your chance to win a copy of the e-book, a Finnigan’s End flask, key chain, book markers and a $10 Amazon gift card. As a bonus: I’ll personally add five more entries to anyone who shows proof that they’ve purchased a copy of The Light at Finnigan’s End before the contest ends. Your proof can be a screen shot of a receipt, email or order confirmation. Either message me on Facebook or Twitter, email me or comment below for your entry! The Light at Finnigan’s End (Rum Runners, Book 2) comes out in less than a month. I have 20 images, each with different excerpt from the book, and I’ll be posting them slowly until release day. 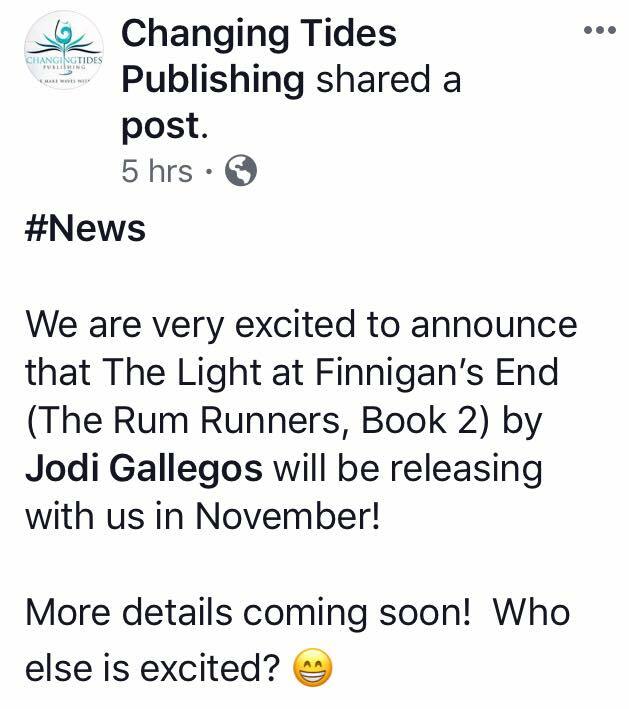 I am so happy to announce that my second book, The Light at Finnigan’s End, is going to be published on November 5, 2018. 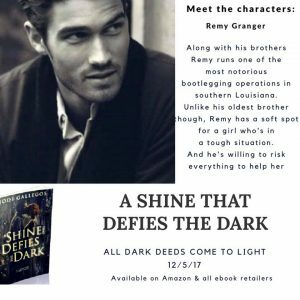 I am again working with the wonderful team at Changing Tides Publishing and this novel will be a follow up to A Shine That Defies the Dark, as well as #2 in The Rum Runners series. Irish immigrant Deirdre Cassidy is determined to find out what happened to her brother, Finn. 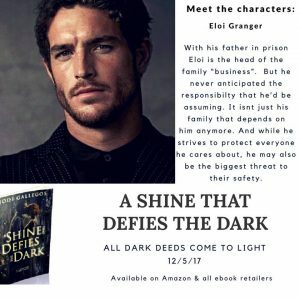 With the Great Depression sweeping the nation, Finn turned to the Moret Gang as a means of earning money and now he’s missing. Deirdre manipulates her way into the depths of the most brutal bootleggers in southern Louisiana and one thing is clear, nothing happens without the approval of Claude Moret or his brother Jack. Before it’s over, Deirdre is determined to kill them both, even if she dies in the process. The one thing Deirdre never counted on was Mo Moret. Claude’s son is as dangerous as he is magnetic, but Deirdre isn’t convinced he’ll ever be able to set aside his Moret loyalty for love. And Deirdre is determined to see the end of the Morets, however that end must come. Many thanks to everyone who continued to ask for a second book and everyone who helped me along the way. As an aspiring author, I never passed a “How I Got My Publisher/Agent” article without scanning for a magic key. That one thing I was missing that would cast open the doors to the world of being a published author. I cringed every time the interviewee said, “my journey didn’t come by traditional means”. I love a solid plan with clear direction. How could I possibly read, map and implement a plan of action based on happenstance? And so, I continued to query—and obsessively review interviews! Then, one day, it happened. I received an offer of publication. How did it happen? Well…um, not by entirely traditional means. My 2015 NaNoWriMo project was a young adult (YA) bootlegger novel. After revisions I began to query it and entered some on-line contests. In 2016 I was selected as an alternate and had the great opportunity to revise my manuscript and query letter with the help of two wonderful authors and an amazing editor. I’d become acquainted with one of the authors in online groups and the editor in another contest. In the meantime, I met a local author who also worked for a small press. I went to her signings, asked endless questions at SCBWI events, and joined her book club (all of this was not nearly as stalker-ish as it sounds). Even though we became friends, I didn’t submit to her because I didn’t want her to feel I “expected” anything from her—except the information. During an online pitch contest she favorited my pitch and I submitted my YA bootlegger/romance to her. The publisher ultimately passed on my novel, but with good feedback. A year later that publisher, Crimson Tree Publishing/Clean Teen Publishing, started a romance imprint. 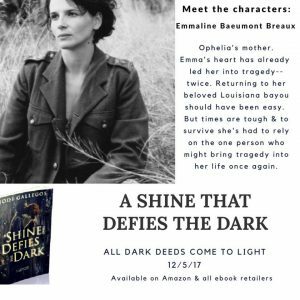 I was asked if I was still seeking publication for A Shine That Defies the Dark (I was!). I re-submitted my manuscript to the managing editor and—after a few changes to make my novel better suited for a new adult (NA)/adult romance—I received an offer of publication. Getting the email of acceptance was a surreal experience. Although you dream about the moment, once it happens it really is like waking up from a dream. Make real connections with people. Ask questions, support others, take an interest in their non-writing lives as well as their writing/editing/publishing/agenting. Consider the advice/feedback you’re given. You don’t have to take it all, but you should consider it, especially if you’re hearing it from several people. Query widely. Consider agents as well as small publishers. The best of luck to all those who are still on their journey and a heartfelt “Thank you” to everyone who helped me along the way. 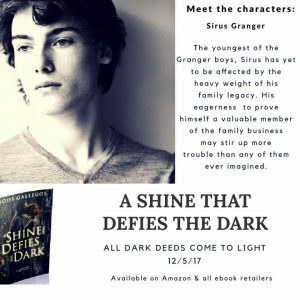 A Shine That Defies the Dark comes out in two days! You can get your digital copy of A Shine That Defies the Dark from all major retailers. You can also get an autographed print copy from my website (available 12/14/17).